Saudi Arabia is within months of completing its first nuclear reactor, new satellite images show, but it has yet to show any readiness to abide by safeguards that would prevent it making a bomb. 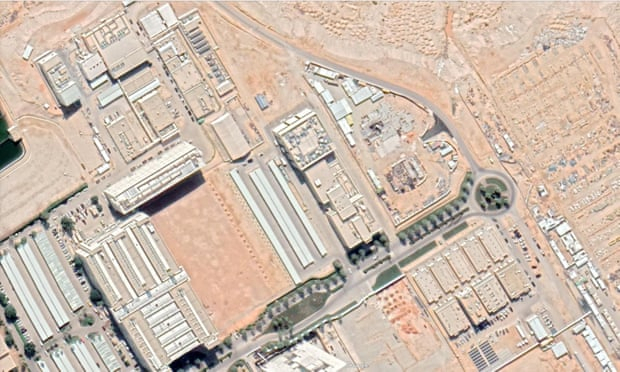 The reactor site is in the King Abdulaziz city for science and technology on the outskirts of Riyadh. The site was identified by Robert Kelley, a former director for nuclear inspections at the International Atomic Energy Agency (IAEA), who said it was very small 30-kilowatt research reactor, not far from completion. “I would guess they could have it all done, with the roof in place and the electricity turned on, within a year,” said Kelley, who worked for more than three decades in research and engineering in the US nuclear weapons complex. The satellite photos show that a 10-metre high steel tubular vessel, which will contain the nuclear fuel, has been erected, and construction work is under way on the surrounding concrete building. Kelley said the main practical purpose of the research reactor would be to train nuclear technicians, but it also marked the crossing of a nuclear threshold. Before inserting nuclear fuel into the reactor, Saudi Arabia would have to implement a comprehensive set of rules and procedures, including IAEA inspections, designed to ensure no fissile material was diverted for use in weapons – something it has so far avoided. The reactor has been designed by an Argentinian state-owned company, Invap SE. The emergence of the satellite images, first published by Bloomberg, comes in the midst of a struggle between the Trump White House and Congress over the sale of nuclear technology to Riyadh, after it emerged that the US department of energy had granted seven permits for the transfer of sensitive nuclear information by US businesses to the Saudi government. The secretary of state, Mike Pompeo, and the energy secretary, Rick Perry, have both stonewalled congressional committees demanding to know what the authorisations were for, and which companies were involved. On Tuesday, the head of the independent Nuclear Regulatory Commission, Kristine Svinicki, and her fellow commissioners remained silent when repeatedly asked by Democratic senator Chris Van Hollen, whether the commission had been consulted on the nuclear permits. Tempers flared last week in a confrontation between Pompeo and the Democrat-run House foreign affairs committee, when legislators demanded to know why the administration appeared to be shielding a Saudi regime responsible for wholesale human rights abuses, mass civilian deaths in Yemen and the murder and dismemberment of Washington Post columnist and dissident Jamal Khashoggi. Sherman said the issuance of the seven permits, known as Part 810 authorisations, represented an effort by Trump and his son-in-law Jared Kushner to bypass Congress, and spare the Saudi monarchy the need to accept a formal agreement that would put strict limits on its nuclear programme. “It tells the country that if Jared and Donald Trump can transfer nuclear technology to the Saudis on seven occasions and not reveal the details to members of Congress with the highest national security clearance, even in special classified rooms – what are they hiding?” Sherman said in a telephone interview. He said there was a bipartisan majority in Congress that would insist Saudi Arabia could buy US nuclear technology only if it agreed to the “gold standard”: no enrichment of uranium and no reprocessing of plutonium, and the acceptance of intrusive IAEA inspections. A report in February by the House oversight committee cited evidence from whistleblowers that senior White House political appointees, had repeatedly pushed for a quick deal to sell nuclear reactors to Saudi Arabia, without non-proliferation safeguards. According to the report, the campaign was led initially by Trump’s first national security adviser, Michael Flynn, who had close ties to one of the companies pushing the scheme, IP3 International, but it was pursued after Flynn was fired, by Kushner, Perry and a Trump friend, Tom Barrack. Saudi Arabia joined the Non-Proliferation Treaty (NPT) in 1988 but signed a comprehensive safeguards agreement with the IAEA only in 2005, and at the same time exempted itself from regular inspections, by signing a “small quantities protocol” (SQP), designed for countries with negligible quantities of nuclear material. Largely because of controversy over Riyadh being shielded from scrutiny under these rules, the IAEA made the SQP more rigorous, but the Saudis resisted making changes. “Saudi Arabia was the last country allowed to sign the old SQP. And they never agreed to adjust or rescind it,” said Laura Rockwood, a former senior official in the IAEA’s legal affairs office, now head of the Vienna Centre for Disarmament and Non-Proliferation. Thomas Countryman, who was assistant secretary of state for international security and nonproliferation in the Obama administration, said his negotiations with Saudi officials stalled over their resistance to accepting prohibitions on enrichment or reprocessing, as well as a strict IAEA inspections protocol. “I believe the Saudis saw an opportunity with Trump and Kushner to conclude this rapidly on their terms, holding out the promise of major purchases,” Countryman, now board chairman of the Arms Control Association, said. He thought it unlikely the seven export permits issued by the administration would be any help to Saudi Arabia in developing nuclear weapons, but he questioned the lack of transparency involved.